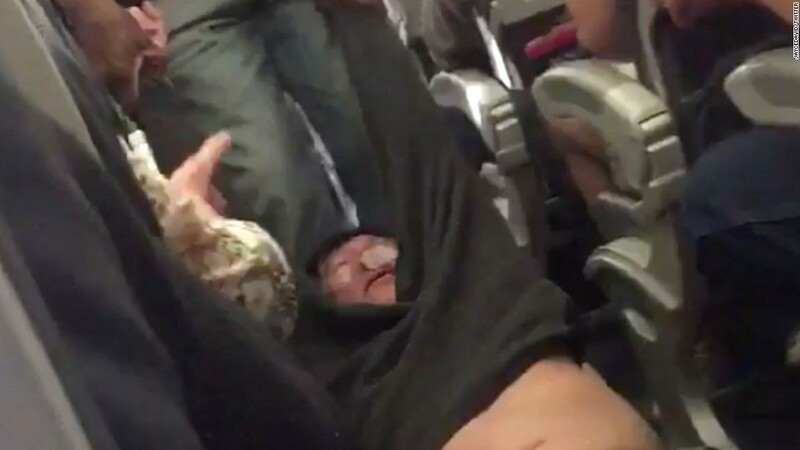 (CNN) A man’s refusal to give up his seat on an overbooked United Airlines flight led to a disturbing scene Sunday that has travelers up in arms over airline policies. The Department of Transportation said it will review the incident, in which a passenger was forcibly removed from the Louisville, Kentucky-bound United flight 3411 at Chicago O’Hare International Airport. The incident has prompted one security officer’s suspension and created a publicity nightmare for United. Several passengers recorded the incident on their phones and posted video on social media showing three Chicago Department of Aviation security officers dragging the man, who has not been identified, down the aisle by the arms and legs while other passengers shout in protest.He continued to resist after he was removed and ran back onto the airplane, face bloodied from the encounter. “It was very traumatic,” passenger Jade Kelley said. She did not witness the entire event but she said the sound of the screams still haunt her. The incident sparked criticism of a system that allows airlines to involuntarily boot passengers from flights. United was acting within their rights and following policy. Then, the situation turned physical. United asked passengers to give up their seats voluntarily for compensation. Four crew members needed to get on the flight in order to work another one in Louisville or else that flight would be canceled, airline spokeswoman Maddie King said. When no one volunteered, the airline was forced into an “involuntary de-boarding situation,” airline spokesman Charlie Hobart said. United weighs a number of factors to determine which passengers would leave the flight, such as connecting flights and how long the delay will leave the customer at an airport, Hobart said. United employees explained the situation to the man several times, Hobart said. When he refused they followed Department of Transportation protocol and called local law enforcement to forcibly remove him from the plane. Passenger Tyler Bridges said the request for volunteers came after everyone had boarded. It was easy to understand why no one responded — it was Sunday night and the next flight was not until the following afternoon, he said. Bridges said two officers tried to calmly talk the man out of his seat before a third approached him in an aggressive manner. The officer told him he had to get off the plane, and when he resisted, the officer grabbed him out of his seat and carried him out with the other officers. The man hit his head on an armrest, Bridges said. He yelled that he was a doctor and that he was being profiled for being Chinese. The scene left everyone unsettled, including children who started crying, Bridges said. “It was pretty shocking that it got to the level that it got to. In part that’s the man’s fault, when the police came on he shouldn’t have resisted, he should have just left. But it was a pretty unbelievable scene with them grabbing him and pulling off,” he said. Overbooking is not illegal, and most airlines do it in anticipation of no-shows, according to the US Department of Transportation. If no one volunteers, the airline can select passengers for removal based on criteria such as check-in time or the cost of a ticket, according to the US Department of Transportation’s Fly-Rights. In an internal memo, CEO Oscar Munoz said the crew members approached the gate agents after the flight was fully boarded and said they needed to board the flight. They sought volunteers before commencing “involuntary denial of boarding process,” offering up to $1,000 in compensation. When approached, the passenger “raised his voice and refused to comply with crew member instructions,” Munoz said. He grew “more disruptive and belligerent” with each request, leaving agents with no choice to call security officers. He continued to resist even after he was removed, running back into the plane, Munoz said. Passengers shot video of him with blood streaming down his face. “Our employees followed established procedures for dealing with situations like this. While I deeply regret this situation arose, I also emphatically stand behind all of you, and I want to commend you for continuing to go above and beyond to ensure we fly right,” he said. What about those crew members? Munoz issue a statement calling the incident “upsetting” and apologized “for having to re-accommodate” customers. The four crew members did indeed board the plane, and it wasn’t pretty, Bridges said. Passengers berated them, told them they should be ashamed of themselves and embarrassed to work for this company. 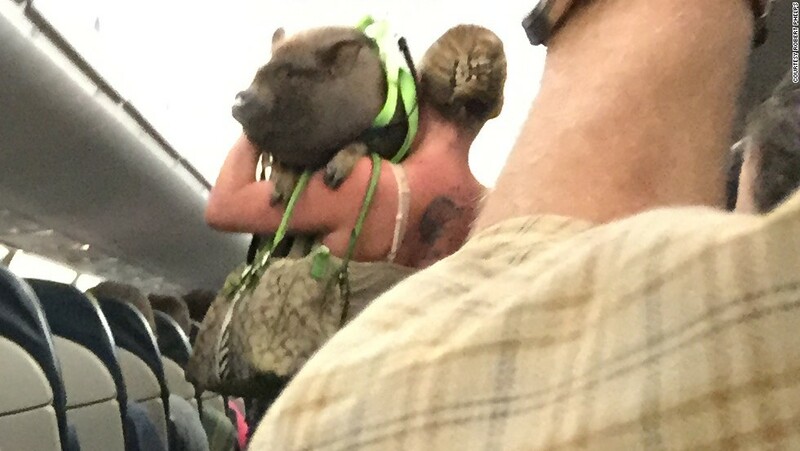 “They just sat down quietly, it was super tense on the plane. Everyone was really unhappy after seeing this man pulled off,” he said.